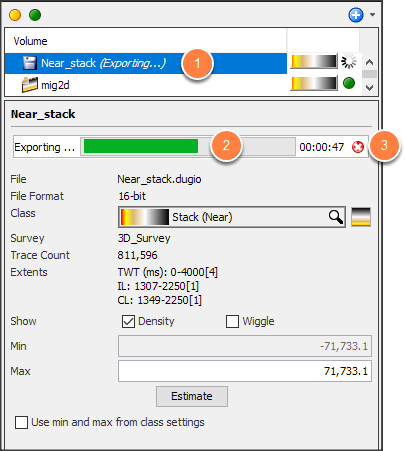 DUG I/O is Insight’s native format for reading and writing seismic or other volume data. Exporting to DUG I/O creates an on-disk copy of a volume. It can be used to improve performance for slow process results. Use DUGIO exporting to create a copy of the data with all on-the-fly changes in place, e.g. Go to Control Panel > Volume tab. Right-click the volume and click Export "volume_name". Or right-click multiple volumes and click Export 'n' volumes. Export Volume window will be displayed. By default, this is set at 16-bit. This setting is recommended for all de-spiked data, but not for unprocessed field data. At File, click the blue folder icon to set the output file name. When the volumes have different extents, Insight exports the full extents of each volume. You cannot change the extents in this case. When the volumes have matching extents, you can change the extents for the export. Override (unchecked) uses the same extents as the volume or line. Check the Override box to specify the vertical extents of the export volume. Select the time or depth domain. If time-depth conversion is configured, time/depth conversion can be performed while exporting. Depth exports can use meters or feet. Set the vertical extent and its increment. For 2D volumes, click this box to see the vertical extents of each line. Edge Detecting: for blocky data, such as impedance volumes. Lagrangian: for smoothly varying data, but not velocities. Linear: Simple linear. Use for ZT and TZ velocity volumes. Nearest: for integer volumes, such as "most likely LID". At Survey, select the survey for the exported volume. 3D volumes can be exported to 3D surveys or along 2D lines. For different extents, samples are interpolated (but not extrapolated) as necessary. At Line set, select a line set to constrain the export (see Creating a 2D Line Set). In the Line column, select (green) or deselect (amber) 2D lines to export. All lines are selected by default. 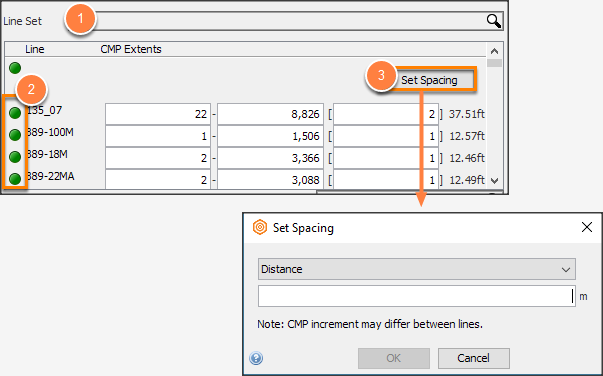 Select Distance or CMP increment. The CMP spacing is adjusted to the nearest whole-trace. Constrain horizontal area: select a polygon/probe to constrain the volume export to the area covered by the polygon/probe (see Creating a Polygon in Map View and Creating a Probe). Set ensemble X/Y from Survey: replace original XYs or add XYs to exported data from selected survey ILCL locations. Override coordinate scalar: define a different volume-wide scalar in the adjacent box. Value must be between -100 and 100 (inclusive). Override elevation scalar: override the scalar of each individual trace. Value must be between -1000 and 1000 (inclusive). Drop all-NaN traces: exclude NaNs when exporting. Add to session when export completes: add the exported volume to the session automatically once export completes. 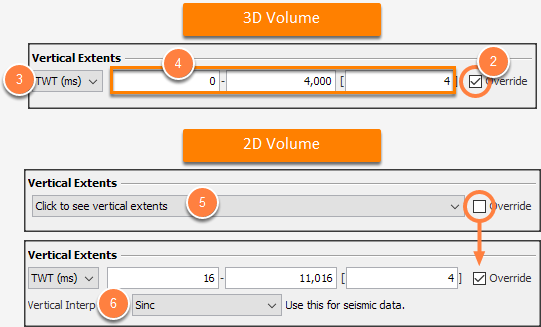 Note: By default, both 2D and 3D volume is exported at its native extents and sample rates in all dimensions. If the extents or increments is changed, missing samples will be interpolated (but not extrapolated) as necessary. Adjust the Performance slider to set the resources use for exporting. This slider controls the number of CPU cores to use. It indirectly affects the amount of memory required -- particularly for processes that require a lot of memory to calculate (such as Volume Smoothing). Note: If you get "Out of Memory" errors when exporting, try reducing this slider. Adjust this value to control the sequence when exporting many volumes. Insight exports multiple volumes in order of priority. Highest priority exports are done first. Click OK to begin exporting. An export indication will be displayed beside the volume name. After the export starts, the progress is shown in the details panel for the volume. Select the Volume in the Control Panel. The progress indicator is shown in the details panel. Click the red x icon to cancel the export. Insight will not allow you overwrite the original data or overwrite a volume that is in use. To continue exporting, select another file to export the volume.